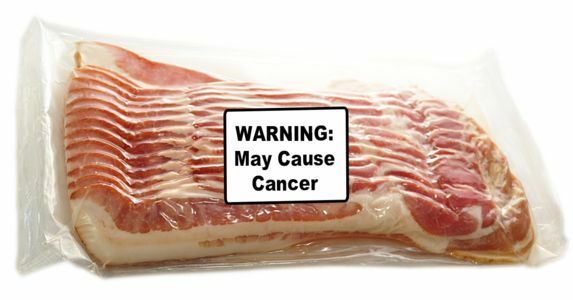 petition: Bacon Causes Cancer — Add Warning Labels! Bacon Causes Cancer — Add Warning Labels! Three years ago, the World Health Organization (WHO) announced that it would start classifying "processed meats" as a group 1 carcinogen, alongside alcohol, asbestos and tobacco. Despite ample evidence backing up WHO's findings, heavy lobbying by the meat industry helped stifle the news, and processed meat sales continued to prosper, putting more lives at risk. But the truth hasn't changed. The consumption of processed meats, like bacon, hot dogs, and sausages, causes an additional 34,000 worldwide cancer deaths each year — and it's all because they use dangerous preservatives: nitrates and nitrites. Please sign this petition demanding that meat manufacturers Hillshire Farm, Oscar Mayer, and Columbus Meats start labeling these cancer-causing preservatives — just like the warning labels on a pack of cigarettes! Using dangerous chemicals to give processed meats their pink color and prolong their shelf-life are just another example of how many dangerous short cuts the meat industry will take to save a buck. Pigs raised for slaughter often live their entire lives in horrific conditions. Sows are crammed into metal gestation crates so small they can't even turn around. Companies will also pump sick animals full of dangerous antibiotics and hormones to make them grow faster before killing them — all to increase profit. This cruelty to farmed animals is well documented, but now we find out that the meat industry is gambling with people's lives and putting them at risk of cancer. It's time to stop. Sign now to tell Hillshire Farm, Oscar Mayer, and Columbus Meats to tell the truth to consumers and add warning labels on processed meats.